Within the boundaries of Florida Keys National Marine Sanctuary rest an array of submerged historical and cultural resources, such as archaeological sites, shipwrecks, structures, or objects associated with past human activities. These physical remains hold clues to the Keys colorful maritime history, and are protected by NOAA and the State of Florida. 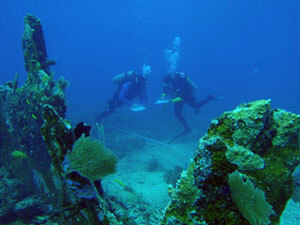 NOAA works closely with the State of Florida to manage and protect maritime heritage resources for future generations. While many areas within the sanctuary that contain historical and cultural resources are open to diving and snorkeling, it is illegal to damage a historical resource, disturb a site, or recover artifacts without a permit. The sanctuary's permit system allows individuals and groups, such as universities or historical institutions, to investigate cultural resources in the sanctuary. Any disturbance or recovery of these resources must be planned and permitted in accordance with state and federal laws. Individuals and organizations seeking to conduct archaeological research within the territorial waters of Florida must seek a permit to do so from Florida's Division of Historical Resources in addition to a FKNMS permit. To further the study of our maritime heritage, the sanctuary has instituted a three-phase permitting system which addresses the survey, recovery, and transfer of the sanctuary's historical and cultural resources. Permit applications for maritime heritage research activities should be submitted at least ninety (90) days in advance of the requested effective date. However, please note that there is no guarantee a permit application will be processed by the requested effective date. The Survey and Inventory Permit allows for non-intrusive surveys of historical resources that include remote sensing, mapping, and documentation. The Survey and Inventory Permit Report must be completed, and accepted before a Research and Recovery Permit will be considered. After satisfactorily completing a Survey and Inventory Permit Report, a Research and Recovery Permit may be issued to allow other prohibited activities that further archaeological knowledge, and may include limited recovery of artifacts only if in the public interest. If NOAA and the State of Florida determine that an object is not of historical interest, it may be eligible to be recovered pending completion of all necessary Research and Recovery Permit field work and reports. Only artifacts that are not of historical interest or have been determined to no longer be of historical interest will be considered for this permit. For more information on a maritime heritage resources permit, contact Matthew Lawrence, maritime archaeologist, at Matthew.Lawrence@noaa.gov.